For the second time in a little more than a month, Denver Archbishop Charles Chaput has suspended a priest on an allegation of sexual misconduct with a minor. 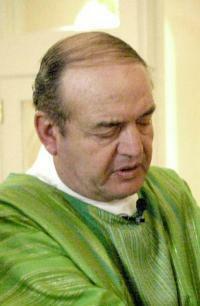 Father Dorino DeLazzer, 75, who retired as pastor of Sacred Heart of Mary Church in Boulder in 2005, was placed on administrative leave from the archdiocese, for which he still serves. "On May 7, I received a credible allegation against him for past sexual misconduct with a minor that reportedly occurred in the early 1970s before Father DeLazzer served in Colorado," Chaput said in a statement late Sunday. The announcement comes just more than a month after Chaput removed another priest because of an allegation of sexual impropriety. A former parishioner accused the Rev. Mel Thompson, now 74, of sexually abusing him more than 30 years ago. In both cases, the church contacted police. "Consistent with our policies, we have reported the allegation to the civil authorities in the county and state where the accusation allegedly happened," Chaput said Sunday night. "We have begun an internal investigation into the allegation." The criminal investigation into Thompson's alleged acts in the 1970s has been slowed by questions over the statute of limitations. In the 1970s, victims had only three years to make a report, but since then the state's statute of limitations for such cases has been eliminated. The law, however, would force authorities to comply with the statute that was in effect at the time of the alleged crimes, officials have said. Chaput said it was the first such complaint about DeLazzer. "It concerns events from more than 30 years ago, and every accused person has the right to be presumed innocent," he said. DeLazzer's other parish assignments in the Archdiocese of Denver include St. Pius X in Aurora from 1973 to 1974; St. James in Denver from 1974 to 1976; Spirit of Christ in Arvada from 1976 to 1981; All Saints in Denver from 1981 to 1984; St. Mary in Greeley from 1984 to 1991; and St. Michael in Craig from 1991 to 1999.